Scientology is easy meat…what about the real religions? Marina Hyde, in todays’s Graun, notes with approval the various clobberings that the Church of Scientology has suffered recently. In France, they’ve been found guilty of fraud while over in Hollywood director Paul Haggis has broken with them after his wife was ordered by the “Church” to “disconnect” with him. Now Scientology’s chief spokesman has stomped out of a TV interview with Martin Bashir after being pressed on the alien stuff. Best of all it’s on it’s on You Tube. But, as Hyde suggests, giving the fringe nutters of Scientology a tough time is relatively easy: “Imagine for a moment a Bashir-type interview with a cardinal. ‘So,’ he might inquire, ‘you’re saying that by some magic the communion wafer actually becomes the flesh of a man who died 2,000 years ago, a man who – and I don’t want to put words into your mouth here – we might catagorise as an imaginary friend who can hear the things you’re thinking in your head? And when you’ve done that, do you mind going over the birth control stuff? You don’t think that the excellent Ms Hyde could possibly be taking a sideswipe at her own paper and its penchant for giving a platform to religious proselytizers in general and – especially – apologists for Catholicism and Islam like Maddie Bunting, Karen Armstong and Terry Eagleton? …or should it be for the Muslims of the UN “safe haven” of Srebrenica? Radovan Karadzic, the former Bosnian Serb leader responsible for the foulest ethnic pogroms in Europe since the Nazis, is going on trial. Amongst the charges he will face are nine counts of war crimes and crimes against humanity for the seige of Sarajevo in 1992-95 and two counts of genocide for the mass murder and deportation of tens of thousands of Bosnian Muslims in 1992 and at Srebrenica in 1995. The estimated number of Muslim men killed at Srebrenica range from 7,000 to 10,000. And a further 18,406 Muslims, Serbs and Croats are still listed as missing. It was carried out under Karadzic and Ratko Mladic under a “direct chain of military command” (quote from the 1999 International Criminal Tribunal) from Belgrade and the Serbian President, Slobodan Milosevic. It is predicted that Karadzic will use the same tactics -conducting his own defence, refusing to recognise the court, etc – as his old boss Milosevic deployed to grandstand and delay the trial. Clark is a particularly crass and disgusting power-worshipper who seems to get a kick out of glorifying mass murder and genocide. But the Morning Star is a quite widely-read publication supported by most British trade unions, regardless of their formal politics. Will the Star (with or without the sicko Clark) be defending Karadzic? I’ve just obtained a CD reissue of an LP by one of the finest “mainstream” jazz groups from the 1970’s: the Ruby Braff – George Barnes Quartet (on “Jazz Lips” JL 765). The interplay between Braff’s cornet and Barnes’ guitar is so close and sympathetic that the listener assumes that these two musicians must have been very, very close both musically and personally. The truth is that, despite the self-evident musical empathy, they hated each other. I don’t know how many readers of this blog also read the Express, the Star (Daily, not Morning), the Sun or the Mail: somehow I suspect, not very many. 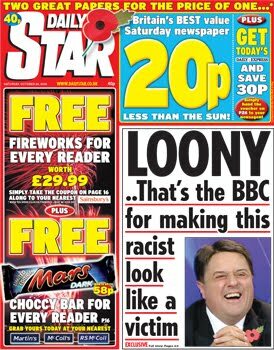 Tabloid hypocrisy over Nazi Nick is brilliantly exposed here. BNP on Question Time: what would have been the point of banning Griffin? If, like me, you watched Thursday’s audience-record-breaking edition of Question Time, you’ll more than like have been as revolted by the odious chubby fascist’s performance as I was. Griffin spluttered implausible denials of his vile politics at points, and at others actually came out with them, for instance in the course of his bigoted comments about homosexuality. All the while he sat sweating, grinning inanely and laughing inappropriately, and generally looking like a man having a terrible time. Meanwhile, as Jim mentions in his previous post, the three mainstream politicians failed to land much of a punch on him, with particular dishonour going to Jack Straw for his impotent flailing when questioned about Labour policy (on immigration, although in reality the Labour Party’s culpability goes wider) and its role in the rise of the BNP. Like Jim, I believe that honours for the night go to Bonnie Greer for her extraordinary dignity, refusal to engage with Griffin on his level, and her forensic destruction of his laughable grasp of history. There has been a debate within the media and political circles alike, about the rights and wrongs of the BBC’s decision to allow Griffin on to Question Time. The majority on the left and amongst centre-left liberals appear to believe that he should not have been invited in the first place. From liberals one tends to hear various statements to the effect that Griffin should not have been allowed on because of the odiousness of his views and the possibility of their inciting racial hatred. On the left, one hears various recitations of the old mantra, “no platform for fascists”. But… what do these actually mean? The liberal argument is especially vacuous. Of course Griffin is a foul human being whose views would disgust most Tories, let alone liberals and left-wingers. Of course the vast majority of people from all classes and communities in the UK would refuse to associate themselves with this political gargoyle or anyone with views similar to his. However, there is something more than a little patronising about the idea that white working-class people in the UK would, at the mere sight of the BNP fuhrer grinning and sweating his way through an episode of QT, go out and attack the nearest person from a BME community that they happen to run into. Obviously he wouldn’t have the same hypnotic effect on a Guardian columnist/Comment is Free writer/other liberal pundit, because they’re far too right-on, not like them peasants on the estates. It is patronising and nonsensical – people who were racist before 10:35 pm last Thursday still will be, and people who were not are unlikely to have been persuaded by Griffin’s gibbering under the spotlight. From the left as I say, it is the “no platform” argument which is heard. This is more serious, albeit in this case often distorted through the prism of calls on the state and the media to do a job which rightly belongs to working class people. The most obvious elephant in the room with the advocates of this form of no platform, is that it doesn’t work. The net result of shunning argument directly with the BNP has been to enable them to fester and grow in parts of the country where people do not follow the conventional political media, feel ignored by the main political parties, and are utterly divorced from mainstream political debate. As a consequence, a fascist party gained hundreds of thousands of votes at the June European elections, and now has 2 elected MEPs. That hardly sounds like a vote for more of the same. It is only an opinion, but in my view the time has come to shine the light of publicity directly on the BNP. Whilst it is possible (at a decidedly large stretch) that some people may have watched Griffin on Thursday and been persuaded to the cause of fascism, it seems to me more likely that neutrals of all backgrounds will have been horrified. The long-term outcome of the BBC’s decision, it seems to me, will be to galvanise opposition to the BNP beyond its usual redoubts and into the population as a whole. Ask yourself this: you probably know several people who would describe themselves as “non political”. Some of them probably have at least one opinion that would be seen as a bit off-colour in left-wing circles. Did any of those people come to you with outpourings of praise for Griffin’s performance, and say that they were now persuaded to vote BNP? My guess is that none of them did. Where BNP candidates win and enter the spotlight, they fail quickly thereafter. It is precisely their shodowy existence and freedom from media scrutiny that allows them to grow on the basis of the perpetuation of myth, rumour and innuendo – and on the basis of the threat of violence as well. Media lynch mobs attacking the BNP? Bring it on. It looks like there were some interesting goings-on at a recent SWP national council. Two very similar motions were debated, one put forward by the Central Committee, one by John “Sheriff of Nottingham” Rees. Was it really about no platform, or about something else? You decide. Rees’ motion was signed by 65 members of the SWP. 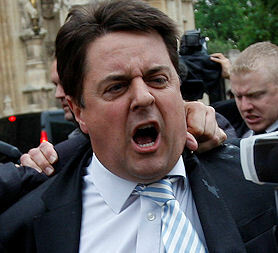 Like many of you, I’m sure, I’ve just been watching tonight’s Question Time aka ‘The Nick Griffin Show’. What follows are just some initial thoughts: feel free to add to them and/or tell me I’m talking rubbish. Firstly, it wasn’t the disaster that I had feared. For all his much-vaunted media skills and “sophistication”, Griffin did not come over well. He looked nervous and sweaty, grinned inanely throughout and couldn’t answer simple questions about his own history of holocaust denial or his words to Klu Klux Klan boss David Duke. I’d feared that Griffin was in a no-lose situation: if his appearance on the programme went ahead, the BNP would have achieved a major victory – an entry into the mainstream of British politics; if his invitation had been withdrawn he would once again portray himself and his fascist rabble as the persecuted victims of a fearful liberal “establishment”. My fears deepened when I heard who the other panelists would be: Lib Dem posh-boy Chris Huhn, the unelected Tory Baroness Warsi (who is on record espousing views on gays that the BNP would agree with) and Jack Straw, a politician whose record (particularly with regard to appeasing clerical fascists like the Muslim Brotherhood) could have made him easy meat for a skilled white fascist debater. Well, in the event Huhn, Wasi and Straw managed to give Griffin a hard time, though Huhn’s attempt to come over tough on immigration brought a snort of derision from Griffin, while Straw squirmed about denying that the rise of the BNP had anything to do with poverty and inequality under New Labour, and the Baroness looked distinctly uncomfortable as she endorsed civil partnerships. But in the end, none of the politicians landed a knock-out punch. It was the wonderful Bonnie Greer, the culture and arts commentator, who finished him off, utilising a deadly combination of mockery, derision and denunciation. She sat next to Griffin and addressed him, smiling, as “Nick”: bloody hell, I thought: the stupid woman thinks she can win him over by being the only person on the panel to be nice to him! How wrong I was. I don’t know whether Ms Greer planned her strategy carefully in advance, or whether it just came naturally. But either way, it was devastating. She mocked his ignorance of history and the entire concept of a politics based upon the ridiculous idea of “indigenous people”; she offered to lend him some books; she became indignant when he started talking about David Duke being from a “non-violent” branch of the KKK; finally she invoked her white in-laws as examples of the common sense of “ordinary British people” who would not be taken in by the BNP. The argument about the rights and wrongs of giving Griffin this platform will -quite rightly- continue to rage. But thank gawd for Ms Greer who almost single-handedly ensured that Griffin’s potential triumph turned into a humiliation. I say almost single- handedly because the majority of the audience were bloody brilliant as well. PS: In view of Griffin’s ‘Question Time’ denials of racism and anti-semitism, this is well worth a gander. Tomorrow and Friday are the first two strike days for the CWU’s dispute. The Government and the employer are doing everything in their power to defeat this strike. For Unite members it is particularly important that we show support as many of our CMA (Communication and Managers Association) members will be scabbing (and organising the scabbing). would be great if there were groups of Unite members there with flags, etc. transfer to Unity Trust Bank – account no: 20194129 – sort code: 08 60 01.
account 20232065 sort code 08 60 01.
attacks on their jobs, terms and conditions. government carving up the service and carving up their hard won conditions. WORKERS WE WILL ALL PAY THE PENALTY. enough to warrant calling such a meeting. concerns about Royal Mail management. Royal Mail undermines its responsibilities. but this is a veiled threat: if you do not do this you will be disciplined. and is only complaining that it is now being made compulsory. week to show solidarity with the CWU. I was a member of the CMA previously (I worked for Royal Mail until they privatised the IT department 6 years ago) and can confirm that it is true that the scabbing has gone on for years, and has largely been unchallenged. It has now reached a position where it can no longer be ignored, so it is great to see the debate kicking off. I was also at an emergency branch meeting yesterday which was called to discuss the dispute (we have CMA members in our branch). I can report from what is going on the ground in the big Royal Mail admin buildings in Chesterfield, and will throw in my own thoughts too. There is definitely a high level of scabbing, with CMA members travelling to London mainly and lots of overnight hotel stays and overtime for some. But there’s also also a high degree of anger at the orders from Royal Mail’s Higson that all management grades must scab 2 days per week as a minimum, and a degree of exasperation that the instructions coming from Paul Reuter have been far from clear and appear to sit Unite firmly on the fence. This has to stop. The letters from Reuter talk about ‘working normally’ and not doing anything to cause an inter-union dispute with the CWU, but fall very short of instructing members not to take on strike cover, or not to cross picket lines. They say nothing about defending Unite members who do take a stand and refuse the scabbing duties, leaving those who do feel they want to resist isolated and scared. I think the logic from Reuter (and no doubt the legal team who write his mealy-mouthed statements) must be – ‘they have scabbed in the past, they will scab in the future – we can’t challenge the members because we will not win the argument with most of them and if we issue instructions that they don’t like they will ignore us, so lets keep our heads down’. Bullying has historically gone on to get a high level of “volunteering” uptake by management. There are different levels of bullying in each area dependent upon the individual managers particular career aspirations – but I think it is fair to say that it is very widely spread. However those few members who have refused to take part in the scabbing have not been disciplined. So it is clearly a certain amount of water testing by Royal Mail – and to create a 100% compliant management workforce. Whilst I have no sympathy with anyone who lacks the backbone to say no to scabbing duties, it is an important point that Unite is failing the test of leadership in not doing all it can to prevent it, even some basic statements of trade unionism might be a start! I think the letter from Higson to all managers is a gauntlet to Unite – Royal Mail knows that the scabbing operation is currently cosmetic in its effectiveness – it cannot shift the quantities of mail to maintain anywhere near a normal postal service, and is much more about the appearance of doing something to undermine the CWU. It is also pushing Unite to be even more compliant than it has in the past – leaving it free to use it’s management in exactly how it wants with no union influence. By accepting the logic of the current union position those Unite members who don’t want to scab are abandoned to the crazy priorities of a Royal Mail senior management bent on casualisation and privatisation – to be forced into doing work they are not trained for and undermining the effectiveness of the CWU action, and as a result prolonging the dispute. Those members who are doing the scabbing are also left entirely unchallenged by the union – to our eternal shame. ***** is absolutely right that Reuter should declare a dispute over the compulsion action. But it’s not as if there has been a lack of grounds over which to go into dispute – the 30,000 agency staff that Royal Mail has recruited includes a new layer of managers not organised by Unite despite past agreements; the bullying; the pensions issue; health and safety of getting untrained managers driving mail vans etc etc. The stakes are high for the movement and Unite should start to create a strategy that rises to the challenge. Royal Mail will likely look to remove CMA as well if it succeeds in it’s bid to smash the CWU. Unite has to start acting and working much closer with CWU on this dispute as the impact of CWU losing will be catastrophic – even for most of the managers in CMA. That’s another reason why we need to be seen to not condone the scabbing, and should back the CWU in any way we can. Reuter, Simpson and Woodley and McCluskey should also get down to the picket lines as a start of a new direction that is so badly needed for Unite in the post. the same as doing something. to organise scabs. This activity is not confined to “wartime” conditions. do it. If we are not able to put a disciplinary process in place at the next EC we will just have to tolerate the presence of all sorts of scabs and bastards in our union. in the same way as among the other workers they represent has not met. Nor have any of the others because we have allowed the timetable to slip. Why is this? The EC is too big to operate properly and there are genuine problems with locating appropriate sectors for some workers. etc. represent them as workers against their employers? If no, we should not have them in our union. If yes, we have more questions. If no. What structures should we have? If yes, we are all scabs. apply disciplinary sanctions (if we have agreed them in time) in unite. whole issue is a polite reluctance to tell each other when we are wrong.